A flagship project of the National Commission of Culture and the Arts (NCCA), the Taboan Writers Festival is an annual gathering of writers from all over the country. The festival sets up shop in a different region every year where writers, readers, scholars, researchers, and lovers of Philippine literature trade diverse ideas about culture, history and the literary arts. It is an exciting venue for writers to interact with one another and with their audience. The festival usually includes a conference, a book fair, the Taboan Awards, and performances by local artists’ groups, all of which are open to the public. Local and national writers’ organizations, along with universities and schools, particularly their students, faculty members, and researchers, will share in this enrichment of Philippine literature. This year, the 10th Taboan Writers Festival will happen at the 10th largest island of the Philippines, the island province of Bohol with the support and assistance of the USC Cebuano Studies Center, local government of Bohol, the Ramon Aboitiz Foundation, Inc., and Smart Communications. It will be held in the Bohol Cultural Center in Tagbilaran City on 19–20 October 2018. 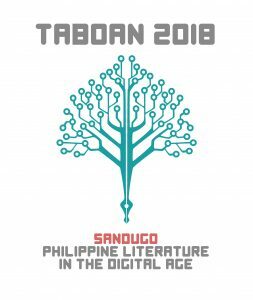 According to Dr. Hope Sabanpan-Yu, chair of the National Committee on Literary Arts and this year’s Taboan Festival Director, the Taboan 2018’s theme is “Sandúgò: Philippine Literature in the Digital Age.” It resonates with Bohol’s cultural identity as well as highlights the writers’ commitment to their art produced during a time when it is often mediated by technology. Keynote speaker is Dr. Resil B. Mojares, and the plenary speaker is Dr. Marjorie Evasco. This year’s Taboan awardees are Ulysses Aparece, Edgar Godin, Melchor Cichon, Raymundo Pandan Jr., Myrna Peña-Reyes Sweet, and, posthumously, Anthony Incon, Clovis Nazareno, and Vicente Ignacio de Veyra. Hundreds of national and local writers as well as teachers and students of literature are expected to attend the festival activities. Panel discussions in parallel sessions on the following topics will be conducted: Diasporic Writers, Environment/Writing Catastrophe, Emerging Experimental Writing, Fake News, Imagi/NATION, and Threats to Nationhood. Panel discussions on the genres of Children’s Literature, Creative Nonfiction, Graphic Literature, Performance Poetry, Speculative Fiction, and Young Adult Literature will also transpire. Official delegates in Taboan Festivals consist of the country’s most prolific and prodigious, as well as promising, writers and mixed media artists. Delegates from NCR are Renante G. Ciar, Edrick S. Carrasco,Will P. Ortiz, Anna Felicia C. Sanchez, Joselito D. Delos Reyes and Dawn Marie Nicole L. Marfil. From Luzon are the following delegates Melvin C. Magsanoc, Roland Erwin P. Rabang, Crispina S. Dela Cruz, Daisy C. Ricardo, Eduardo J. Piano, Roilingel P. Calilung, Honesto M. Pesimo, Jr., Elbert O. Baeta and Monica S. Macansantos. Delegates from the Visayas are Early Sol A. Gadong, Hezron G. Pios, Joanalyn P. Gabales, Charles Dominic Sanchez, Alsteine Joi Diapana, Rosalina R. Sarabosing, Rene Ponte, Noel Tuazon, Reynaldo Monreal, Fred Jordan Carnice, Ramon Boloron, Marianito Jose Luspo, Haidee Emmie K. Palapar, Firie Jill T. Ramos and Jenelyn V. Garcia. Mindanao is represented by Jade Mark B. Capiñanes, Errol A. Merquita, Mario L. Cuezon, Alton Melvar M. Dapanas, Servando Halili Jr., Floraime O. Pantaleta and Jason R. Kanindot.